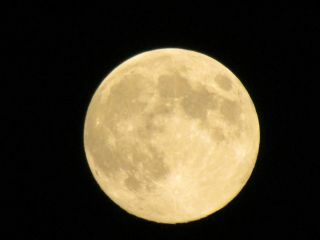 Carole Francis took this picture of the Harvest Moon over northeastern Pennsylvania, September 11, 2011. The full moon that rises this weekend is a special one, carrying the title of "Harvest Moon" for those of us living in the Northern Hemisphere. The moon officially turns full when it reaches that spot in the sky exactly opposite the sun, and this moment will occur Saturday (Sept. 29) at 11:19 p.m. EDT (0319 GMT Sunday). When you gaze at the full moon this weekend, think of farmers working late into the evening to gather their crop, because that's how the Harvest Moon got its name. The Harvest Moon allows farmers at the peak of the current harvest season to stay in the fields longer than usual, working by the moon's light. It rises around sunset, but also — and more importantly — the moon seems to appear at nearly the same time each successive night. Night-to-night differences in Harvest Moon rise times vary considerably by latitude. For example, Cocoa, Fla, located near latitude 28.4 degrees north, sees moonrise come an average of 36 minutes later each evening. In the town of Priddis, Alberta, Canada, latitude 50.9 degrees north, the average difference is 24 minutes. In contrast, for those living in the Southern Hemisphere, the ecliptic at this time of year appears to stand almost perpendicular to the eastern horizon. As such, the difference for the time of moonrise exceeds the average of 50 minutes per night. For example, in Canberra, Australia (35.3 degrees south latitude), the night-to-night difference amounts to 58 minutes. Interestingly, for those who live near the Arctic Circle (66.7degrees north latitude), the moon does indeed rise at about the same time each night around the time of the Harvest Moon. And for those who live even farther to the north, a paradox: The moon rises earlier on each successive night around the time of the Harvest Moon! At Resolute Bay in Nunavut, Canada (74.7 degrees north), for instance, the times of moonrise on Sep. 29, Sept. 30 and Oct. 1 will be, respectively, 5:32 p.m., 5:04 p.m. and 4:22 p.m. local time — an average of 35 minutes earlier each night. The Harvest Moon is traditionally the full moon that comes closest on the calendar to the September equinox, which marks the beginning of autumn in the Northern Hemisphere and the beginning of spring south of the equator. In 2012 this celestial event comes a bit later than usual. While most traditionally associate the Harvest Moon with the month of September, it occurs in October some years. Between 1970 and 2050, there are 18 years when the Harvest Moon comes in October. The last time was in 2006, and the next will be in 2017. The Harvest Moon can occur as early as Sept. 8 (as in 1976) or as late as Oct. 7 (as in 1987). Some people are under the impression that the Harvest Moon remains in the night sky longer than any of the other full moons we see during the year, but that's simply not so. That particular circumstance is reserved for the full moon closest on the calendar to the Winter Solstice (which this year comes on Dec. 28). Editor's note: If you snap an amazing photo of September's Harvest Full Moon that you'd like to share for a possible story or image gallery, please contact managing editor Tariq Malik at tmalik@space.com.